Bumi Thomas has such a distinctive sound, I find it hard to compare her to anyone. She is who she is and has grasped what it means to own your voice. I heard her live at an event in late 2011, armed with her guitar and voice, she blew me away. Now take that magnetic vocals, marry it to haunting and soothing lyrics, and what you have is an artist who can seduce and empower you at the same time, as well as evoke a varying number of emotions within you. In her own words, Bumi Thomas and the intercultural experiences that define her music. Belinda: Was there a defining moment when you knew music was in your future? Bumi: Absolutely, the moment of truth came at a cross road in my life. At the time I was pursuing the possibility of becoming one of Modern Africa’s leading Female visual artists, the world was my oyster and the mind a place where every concept was attainable. On the other hand music was a form of meditation that quieted my mind when my soul was ready to speak directly to my consciousness. Through melody/song I was able to transcend the boundaries of day to day life and exist in a universal place where everything made sense. It was a call I found irresistible. Music was the creative language that compelled me to speak with my voice as opposed to my eyes, I was captured. I sought to develop both disciplines simultaneously, knowing a time would come when I would have to prioritize one over the other. That moment came in August 2009. Belinda: Give us some insight into your background and heritage? Bumi: I am Nigerian of dual heritage, born in Glasgow and presently based in London. My Father is Yoruba Brazilian whilst my mother is Igbo. It was only recently that I discovered that my mum is actually from a small tribe in the Niger- Delta area that is now regarded as Igbo due to the establishment of new borders. My parents were very culturally conscious in the 80s, constantly travelling and seeking new landscapes and experiences. Due to their shared sense of adventure, we grew up in a very liberal household. I was raised to appreciate and celebrate difference, in myself and others. We moved to Kano, a large metropolis in Northern Nigeria, characterised by arid landscapes and a sense of tranquillity. It was a multicultural oasis in the late 80’s and early 90s. My parents ran a jazz club called Royers Jazz club which was a hotspot for people looking to socialize in a quirky creative environment and experience an eclectic catalogue of great music whilst exploring their cultural narratives. Belinda: In an interview with “This is Africa”, you used the term ‘Afrodity,’ what does that word mean and how does it relate you as an artist, the music you like and create? Bumi: Oh! I meant Aphrodite, the Greek goddess of Love and Beauty…As an artist we are in the business of creation. However, what sets us apart from our contemporaries is the meaning of what we create; the philosophy behind our vision and how that impacts the minds or lives of those that lend their attention to our art. The concept of Aphrodite is quite inspiring as she symbolises fertility, the sacred feminine, the spiritual, cosmic essence of ‘Woman’ as she has existed through the fabric of time as the mother of creation and a purveyor of beauty, the giver of love thus life. To relate this to my music, I identify with the process of giving life to an idea or emotion in hope that it resonates potently through the minds, hearts and even souls of those that encounter it. I personally am drawn to music that has a life altering effect on me. It is this kind of stimulation I seek to evoke in others… the underlying yet latent sense of collective connection between human beings in a pure moment. Creativity is our inner nature. Perhaps you have read between the lines and come up with something special here. ‘Afrodity’ could become a powerful trend or concept. Belinda: As individuals, we all have a story that defines us or at least shapes our creative path and how we go on to define that path and share it with the world. What’s your story, as a woman and creative being? Equally, what’s the impact that story has had on you as a woman and as an artist? Bumi: My story is multi-layered. As individuals we are defined by our beliefs, our philosophy on life and a sense of identity, duty and responsibility to develop our environment through the ongoing use of our abilities. As an individual I realise that I am part of a force greater than myself, an instrument of divine expression with a duty to add value to the world I belong to through the cultivation of the talents that I have been given. This philosophy informs my creative path in life and what I choose to share with the world. As a woman it is my duty to preserve life through all means possible, this includes enriching the mind, and uplifting the spirit. A universal law and one of the principles of physics states that energy can neither be created nor destroyed, it can only be transferred from one form to another thus we are in a constant state of evolution. The impact of this story on my journey as a creative woman is deep sense of appreciation for what I do and how it affects others. I am inspired by the idea of being in a position to inspire others and speak from the heart. Belinda: Do you write your own songs and what inspires the music that you create? Bumi: Yes, I do write all my songs. However I do enjoy co-writing and collaborating with other artists. I am deeply inspired by the belief that we all have a greater purpose in life. I write about the human condition, love, nature, freedom and overcoming adversity. 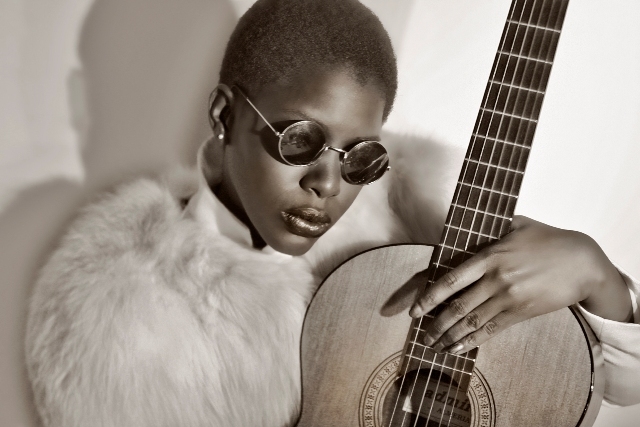 My music explores identity, sensuality, and spirituality, retrospective and cross-culturism. Life is my artistic process. As an artist I like to think of myself as a Nomadic creative moving from one realm to another, exploring the relationship between memory, meaning and experience. This informs my understanding of history and fuels my interest to create and add to it through sharing original ideas. At this stage of my life, my music represents the journey of a modern African creative in the Diaspora and the influences of the cultural diversity that she is exposed to. Belinda: Who are you role models in the music industry, both artistically and musically and what attracts you to them? Bumi: My role models are Harry Belafonte, Miriam Makeba, Fela Kuti & Bob Marley; they were freedom fighters and activists whose voices and music were revolutionary in form and reach with the power to empower generations, the Harlem renaissance, Nina Simone, Jon Coltrane and Herbie Hancock for their powerful voices, compositional prowess and ability to take you to uncharted territory with the potency of their ‘Jazz’ music, Sade Adu’s hypnotic voice and amazing song writing, Maya Angelou and Saul Williams lyricism that has a mystical ability to arrest the soul. Yinka Shonibare’s conceptual genius and courage to question history in his art and finally the sweet tones and rhythms of West African High Life music and Soweto Blues. Belinda: Now, you were born in the UK, raised in Nigeria or at least lived in Nigeria for some time and now based in London again and I am sure you have travelled to other places outsideNigeriaand the UK. In what ways have your journey through different countries and spheres of life influenced your music and continue to influence you as an artist? Bumi: To put it succinctly – Intercultural exposure is the pulse than runs through my work reflecting the sounds of the Diaspora. Magic is what happens when so many rich cultures and traditions are put in a melting pot to create new and thoroughly vibrant forms of art and culture. I simply translate that diversity into music by borrowing nuances of these experiences. I explored music creatively in short, yet potent bursts in high school with the choir and a youth summer project at the Roundhouse in Camden back in 2002. These experiences really set the foundation for the journey I would embark on at a later stage in life. Belinda: I heard you at the Forward event, November 2011 and your music blew me a way…those powerful vocals…haunting and soothing…and you take on the subjects of love, relationships, dreams and I want to make a huge guess and say gender and issues related to women. When you are writing these songs and singing them either in your private space or in public, what do you want to examine, explore and expose through your music? Bumi: Thank you Belinda, you are far too kind. I do sing about love as a healer. Love is our first language in life, we speak it fluently prior to the grasp of words. Our dreams define who we are and who we have the potential to become. These are truths we know yet tend to forget in the transition of life. I like to draw attention to these simple yet deeply profound teachings. Human interaction constitutes of a vast variety of relationships, the relationship with the self and others. Gender plays a big role in how we have been preconditioned to act in society, there is a lot of conflict and confusion in the world as a result of so many people trying to play the roles that have been prescribed for them and as a result forgetting who or what they truly are. Music allows me to address these issues, reminding us to live authentic lives and love freely. Belinda: Music is a mine field when it comes to genres and yours is described as a cross between Acoustic / Folk / Soundtracks / Film music, who do these strands appeal to you? And how would you describe your own sound and the music you create despite the different tags that various individuals may want to put on it? Bumi: Jazz/ Acoustic Soul/Folk/Reggae/ Highlife/Afro-beat/Cinematic Soundscapes – these genres all appeal to me because my music is a fusion of these different sounds and I embrace its diversity. I love abstraction and on occasion will refer to my sound as ‘ENDOSOUL’ which means ‘Inner soul.’ People tend to define you based on their reference systems. I encourage it because it sheds light on how one is perceived in the mind of others and if that perception marries with the intent, then I am happy. The music will always speak for itself. Belinda: You are also a photographer, what attracted you to photography? Bumi: I actually began my creative journey as a painter. As a lover of colour and beauty the brush was my first instrument. I became obsessed with the possibility of painting with light and the power of the photograph to tell stories through visual narratives. What drew me most to the camera is the role it plays in our visual identity and most importantly its ability to document and inform history. Belinda: Do you by any chance marry your photography to your music and have you produced anything using both mediums? Bumi: Initially I kept them quite separate. I worked with other artists as a photographer/art director helping them capture and translate their creative vision to life. I am actually working on a very interesting project that allows me to combine both mediums. This fills me a lot of joy because after so many years of trial and error I think I have reached a place where I can articulate their relationship symbiotically. They now coexist in a complementary space. Belinda: You also use your photography to explore issues to do with women from fashion to other subjects, why is it important to you to highlight the space women occupy in our society and world either through music and photography? Bumi: When I was younger, I spent a lot of time being disconnected from what it means to be a woman. We lived in a male dominated society and everywhere I looked I saw images and read messages that suggested that the woman was weak and deceitful while man was the epitome of strength morally, mentally and physically. Luckily my mum is a strong willed, determined, graceful, highly intelligent and extremely beautiful woman so I did not develop an inferiority complex. Nonetheless I was not blind to the fact that she was an exception to the norm. I strived to develop more ‘manly’ attributes like loyal, tough, friendly…trustworthy. I came to the realisation that I was emulating a publicly accepted inaccurate idea of men at a detriment to my development as a woman. I also realised the reason why I was so conflicted was because of the negative stereotypes I was constantly bombarded with in the media and I knew I had to do something about it. So I use photography as a means of providing alternative streams of information that showcase the strength, character, beauty, integrity and dynamic nature of the woman and the invaluable role ‘she’ plays in society. Belinda: Are you a feminist? Bumi: The word feminist has taken on so many different permutations in the last 30 years!!! I am a believer of justice. As far as equality is concerned between the sexes, we are very different and complimentary by nature, to paraphrase ‘Any woman who dreams of being equal to a man has a very limited imagination’. I advocate empowerment of the mind, body and position of women in society and appreciate the struggle and sacrifices that women throughout history have made for the rights we have today. However, I do not think they fought so hard for us to become aberrations of ourselves. I think we should embrace the fullness of our femininity with a degree of reverence for the power that we possess. Belinda: What are your plans for this year 2012, where your music is concerned and what should people expect from you? Bumi: Oh! this is a wonderful year!! Look forward to great live performances, breathtaking collaborations and I will be releasing some great music. A live album is in the works and I cannot wait to share it with the world. Belinda: If you already have an EP, when can we expect an album from you or should we be expecting an EP? Belinda: Would you say you are a music activist given the heavy subjects you take on? Is your music one of protestation and activism on behalf of the issues you write about/address in your music? Bumi: Yes, I do think of myself as an activist in many ways. Life is political. There are so many voices that go unheard, so many stories that are buried in propaganda and so many issues we are all dealing with at some level. It is reassuring when you realise that you are not alone. As humans one of our most fundamental needs is to be acknowledged and understood, which is a universal concept. I create music that addresses personal & global issues as well as protests against the injustice in the world. Belinda: Where are you most at peace, when singing in your private space, playing the guitar or when you are on stage? Belinda: What’s the feeling that you want people to take away after one of your concerts? Bumi: Music is an incredible form of therapy that transcends the host and transmits that feeling to the audience. I want people to walk away from my concerts feeling uplifted, to experience the sensation of release. I want them to feel connected to me, themselves and those around them. I strive to stimulate their minds and emotions. In the words of Jon Coltrane “My MUSIC is the spiritual expression of who I AM- My faith, my knowledge, my being…. When you begin to SEE the possibilities of music, you desire to do something really good for people, to help HUMANITY free itself from its hang ups. I want to SPEAK to their SOULS.” – John Coltrane. This entry was posted on Monday, January 16th, 2012 at 11:23 pm	and is filed under Africa, African Diaspora, Art and Culture, Black Britain, Interviews, Nigeria, Spirituality, Women. You can follow any responses to this entry through the RSS 2.0 feed. You can leave a response, or trackback from your own site.